Microsoft came under fire from some of its rivals on Wednesday for its decision not to offer Internet Explorer 9 -- and hence support for the upcoming HTML 5 standard -- to users of its older Windows XP operating system. Microsoft said at its MIX developer conference in March that IE 9 won't be offered for XP. The reason, technical evangelist Giorgio Sardo said at the Web 2.0 Expo on Wednesday, is that IE 9 is a "modern browser," and getting the benefits of the hardware acceleration and other performance gains that it will offer requires a "modern OS." That didn't sit well with Alex Russell, a member of Google's Chrome browser development team. "Opera and Mozilla are also hardware-accelerating their browsers, and all of us are doing it on XP," said Russell, who joined Sardo and representatives from Mozilla, Opera and Yahoo for a panel discussion on the future of Web browsers. "You describe a world where users are getting left behind," Russell said. At issue is the adoption of HTML 5, an upcoming revamp of the Web's markup language that will add significant new capabilities, including standard ways to implement video, animation, audio and offline storage, that are not included in the current HTML standard. It's important partly because it should help to reduce fragmentation on the Web, which forces developers to build and test applications for multiple browsers or use proprietary technologies such as Flash and Silverlight. But if IE 9, which will be Microsoft's first browser to fully support HTML 5, isn't available for XP, then those users will be outside of that HTML 5 compatibility sphere. And IE 6 still has more users than the Opera, Chrome and Safari browsers combined, according to Crockford. In some countries it accounts for as much as 40 percent of browser usage, he said. But Dion Almaer of Palm, who moderated the panel, said it has become "an anchor around our necks." As Crockford sees it, the W3C "abandoned its role as the stewards of the Web" at the start of the decade, allowing incompatible technologies to flourish. There is now a fresh burst of standards activity around HTML 5. "Which is great," Crockford said, "but it's all irrelevant if we don't solve the IE 6 problem." Microsoft believes HTML 5 is "the future," Sardo said. It has implemented parts of the standard -- which is not yet complete -- in IE 8, and will fully support it with IE 9. Microsoft released its second developer preview of IE 9 on Wednesday morning, he said, though he didn't say when the final product will ship. He also said Microsoft tries hard to keep people's browser software up to date. For example, it allows PCs to download browser updates even if the copy of Windows is unlicensed. This is especially important in China, where a lot of software in use is pirated. "One of the main challenges at Microsoft is the complexity of adopting a new spec," Sardo said. HTML 5 is "a great spec and it will lead to a great future for developers, but it's still a work in progress." Ensuring the implementation is the same across all browsers involves "a lot of work to test and validate." Eich said Mozilla has "got a lot of HTML 5 already implemented, even though it's a moving target." Crockford proposed a radical solution to get all the Web's users onto a current browser: On an agreed-upon day, all developers would deny access to their Web sites unless the visitor's browser is up to date. "On one day, all of us will say, you have to download one of these five or six browsers," he said. "I propose that day is 30 days after all the major browser vendors have implemented HTML 5. 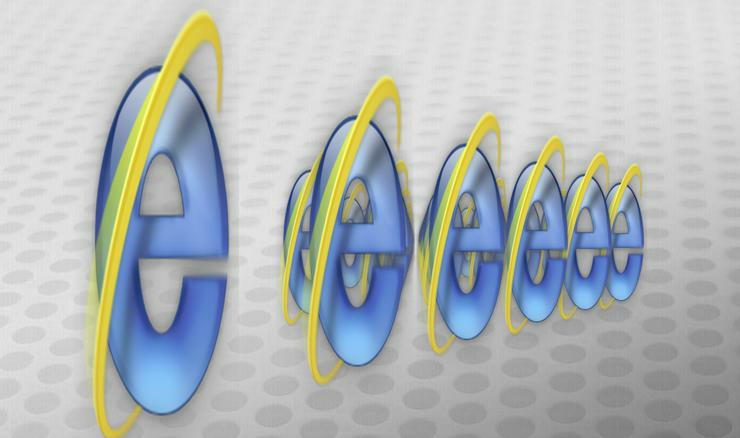 On that day, IE 6 dies." It may not have been a very practical idea, but it earned him a round of applause from the developers watching the discussion.